Here recently started to rain and was frosty at once and on the next day snow. True winter. And wanted a hearty meal, but also vitamin one — so turned out delicious salad, hearty and vitamin. Boil eggs, divide whites from yolks, dice whites, finely grate yolks. Dice kiwi and chicken breast finely. Stir in bowl all ingredients (except yolk) with mayonnaise. Spread salad on plate, sprinkled with grated yolk and seeds of pomegranate. 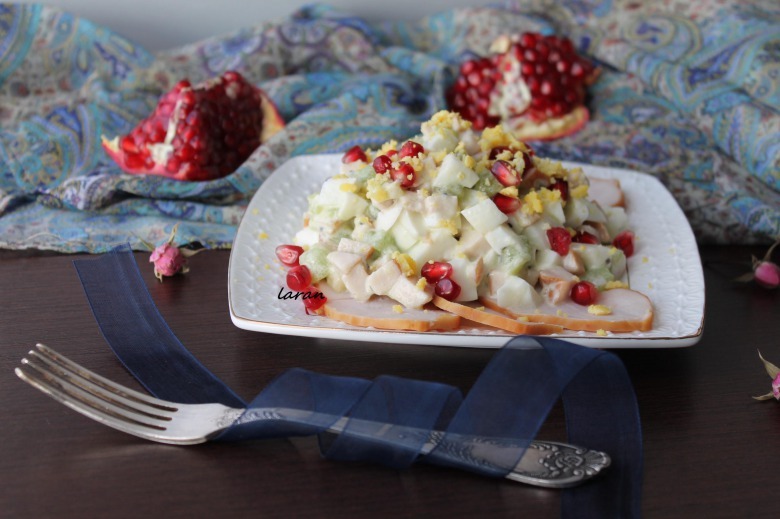 Top of recipe "Salad with chicken breast and pomegranate"